The third and final storm of our shower season hit this weekend. Thanks to Aunt Connie (The crafty cake maker) and Cousin Amy (The practical parent), for putting it all together, along with Aunt Sherie (The elegant hostess), for providing the facilities. 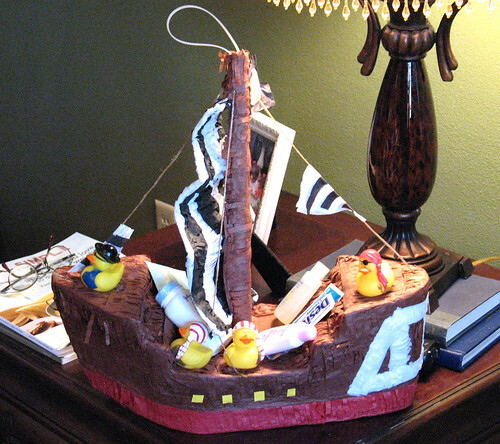 The theme was some sort of post apocalyptic setting, where rubber ducks have become pirates and taken over the world. 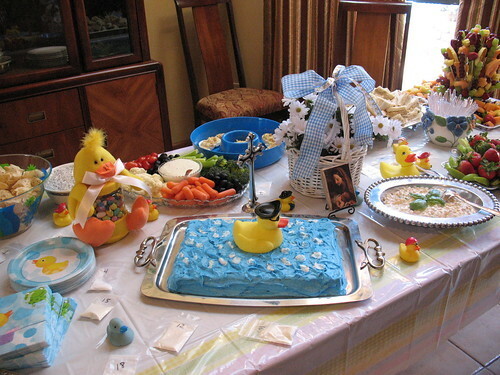 Ok, maybe thats a little stretch, but there were plenty of rubber ducks, pirates, and pirate rubber ducks to go around. And as usual, Connie rose to the occasion with the ridiculously crafty idea of making pacifier decorations out of 2 lifesaver mints and a jelly bean. 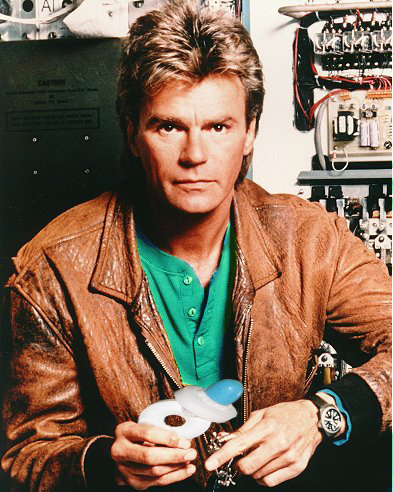 Even MacGyver is impressed with that one. Neither of us is pirate obsessed, but once we registered for the bedding, the theme kinda took off on its own. We're fine with it. It is infinitely better (for us) than some generic sports theme, or lots of pastel flowers. Plus I'm already planning a really cool toddler bed (with a slide) to look like a pirate's hideaway. 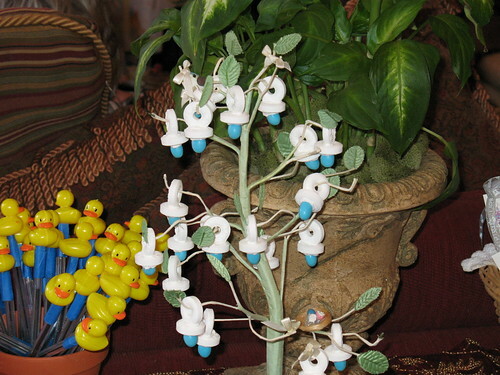 Notice the dozens of small rubber ducks. They are an overwhelming force. And though these items weren't handed over at any shower, we must thank Heather and Trey for leasing us (at no cost, I think) their baby swing, baby seat, and two car seat bases. They were thoughtful enough, when having Lillian, to register for gender neutral colors, so our boy won't be getting all softened up when using their stuff. 1. 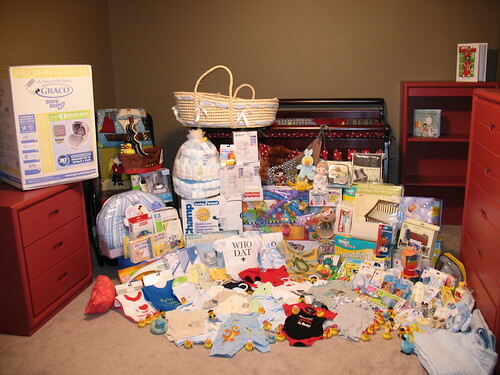 Keep this photo, because you will never again have time to arrange so many items so artfully. 2. shower photos but mostly baby photos. Baby Wallace will have his turn, don't you worry. 3. I hope his Who Dat onesie still fits by the time the season starts. 1. Just to be clear, BRANDON arranged all that. 2. Can't wait until we can have pics of TWO babies at family functions! 3. Don't worry, he will wear it as soon as it fits, regardless of what sports season it is!